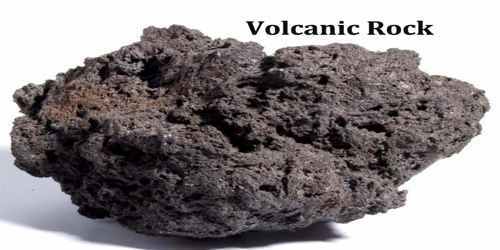 Volcanic rock is an igneous rock of volcanic origin. It differs from other igneous rock by being of volcanic origin. Volcanic rocks are usually fine-grained or aphanitic to glassy in texture. They often contain clasts of other rocks and phenocrysts. Volcanic rocks are among the most common rock types on Earth’s surface, particularly in the oceans. On land, they are very common at plate boundaries and in flood basalt provinces. It has been estimated that volcanic rocks cover about 8% of the Earth’s current land surface. Volcanic rocks are named according to their chemical composition. Basalt is a very common volcanic rock with low silica content. Rhyolite is a volcanic rock with high silica content. Rhyolite has the same chemical composition as granite and basalt is compositionally equal to gabbro. Intermediate volcanic rocks include andesite, dacite, and latite. 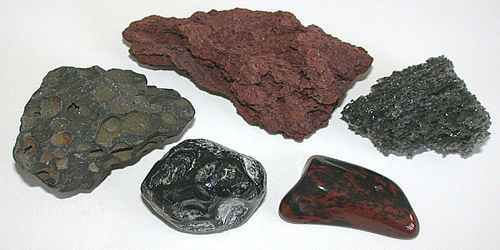 Volcanic rocks are usually fine-grained or aphanitic to glass in texture. They often contain clasts of other rocks and phenocrysts. Phenocrysts are crystals that are larger than the matrix and are identifiable with the unaided eye. Rhomb porphyry is an example with large rhomb shaped phenocrysts embedded in a very fine grained matrix. Volcanic rocks often have a vesicular texture caused by voids left by volatiles trapped in the molten lava. Pumice is a highly vesicular rock produced in explosive volcanic eruptions. Volcanic rock is formed by the cooling of magma or lava. This type of rock is classified by cooling time and the type of magma it is formed from. The properties of these rocks vary greatly, including their chemical composition, grain structure, texture and color. It is also known as igneous rock. 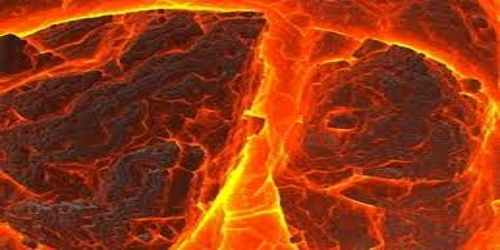 It is produced by the melting of the Earth’s crust into magma. There are two primary types of igneous rock: intrusive and extrusive. Intrusive igneous rock is produced by the slow cooling of magma below the surface. Extrusive igneous rock is produced by the rapid cooling of lava above the surface. 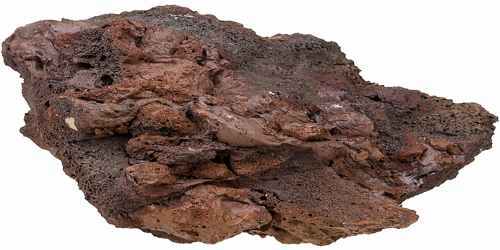 In addition to cooling times, igneous rock is further categorized by the type of magma it is formed from, whether felsic, intermediate, mafic or ultra mafic. Most volcanic rocks share a number of common minerals. Differentiation of volcanic rocks tends to increase the silica (SiO2) content mainly by fractional crystallization. Thus, more evolved volcanic rocks tend to be richer in minerals with a higher amount if silica such as phyllo and tectosilicates including the feldspars, quartz polymorphs and muscovite. While still dominated by silicates, more primitive volcanic rocks have mineral assemblages with less silica, such as olivine and the pyroxenes. Bowen’s reaction series correctly predicts the order of formation of the most common minerals in volcanic rocks. The terms lava stone and lava rock are more used by marketers than geologists, who would likely say “volcanic rock” (since lava is a molten liquid and rock is solid). “Lava stone” may describe anything from a friable silicic pumice to solid mafic flow basalt, and is sometimes used to describe rocks that were never lava, but look as if they were such as sedimentary limestone with dissolution pitting. To convey anything about the physical or chemical properties of the rock, a more specific term should be used; a good supplier will know what sort of volcanic rock they are selling.